On a recent first date, I offered a typical probing question: what's your favorite movie? Acceptable answers include TRON, Star Wars (episodes IV – VI only, of course! ), Wit, and the like. So I didn't know what to make of someone who responded with Enchanted. A Disney movie? I don't know why I was so taken aback; I count Aladdin and The Incredibles among my DVD collection. I proved more curious in the film than in its admirer, and after renting said movie, I'm happy to report something positive came of the evening. 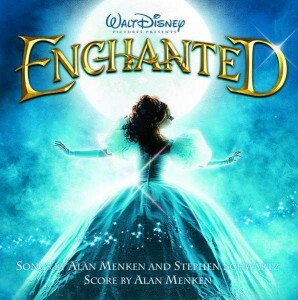 Enchanted is a 2007 film that draws on the House of Mouse's extensive library to create an original yet familiar tale. It opens with an animated musical sequence that introduces us to a wicked stepmother, her royal son, and an innocent beauty whose friends are the woodland creatures. Desperate to keep the blissful couple apart, the stepmother casts the girl into a foreign land "where there are no happy endings" — New York City. The film then transitions into a live-action story with occasional glimpses back into the cartoon world. From here, the story is somewhat predictable: Giselle (Amy Adams) wanders around the Big Apple until native New Yorker and divorce lawyer Robert Philip (Patrick Dempsey) takes her under his wing until her Prince Edward (James Marsden) can come to the rescue. In the meantime, both Giselle and Robert have the values of their worlds to teach each other, producing some comical pairings. Yet the predictability does nothing to deter the joy of the experience. The star of the film is without a doubt Amy Adams, whose wide-eyed naivet&#233 is captured in her every nuanced movement. Her poise, carriage, and inflections make it believable that she really is a Disney princess stuck in a real person's body. When other characters from the magical land of Andalasia arrive in New York, their performances are amusing, but nowhere near as detailed as Ms. Adams'. James Marsden is almost unrecognizable as the over-the-top, single-minded, valiant prince. I'm familiar with the actor's work only as brooding characters, such as Lois Lane's husband in Superman Returns and the mutant Cyclops in the X-Men trilogy. To see him acting so goofily was a welcome contrast. Susan Sarandon gets little screen time but is a wickedly wicked witch. It's not just the transplants who are bewildered by their surroundings, as their behavior befuddles their New York friends in many amusing scenes. Giselle's animated proclivity to randomly burst into song embarrasses Robert, who doesn't want people to stare — and when the song explodes into a full dance number, he's astonished to see Central Park overtaken with choreography as he finds himself in one impossible scene after another. Disney's heritage is evident in more than just the 13 minutes of cel-animated, non-CGI animation, or in the catchy, upbeat soundtrack and colorful musical numbers. We have clich&#233 and tropes from every past film, including talking animals, poisoned apples, and bumbling henchmen, but updated and even lampooned enough to make them enjoyable. Not all the allusions are so obvious; multiple shots and scenes are set up exactly like their cartoon ancestors, as shown in this side-by-side image gallery. Even just a simple but effective twist freshens what otherwise would've been a hackneyed climax. Enchanted is both classic and modern Disney. It's a traditional tale that young audiences will enjoy, but pays homage to the predecessors that adults grew up with. Like any excellent family film, Enchanted has something for everyone. As you pointed out, I had fun spotting the references, scenes, etc from previous movies. The one "near miss" scene that did surprise me a little was the Lady and the Tramp dinner which didn't use spaghetti and meatballs. A pizza just wasn't the same!